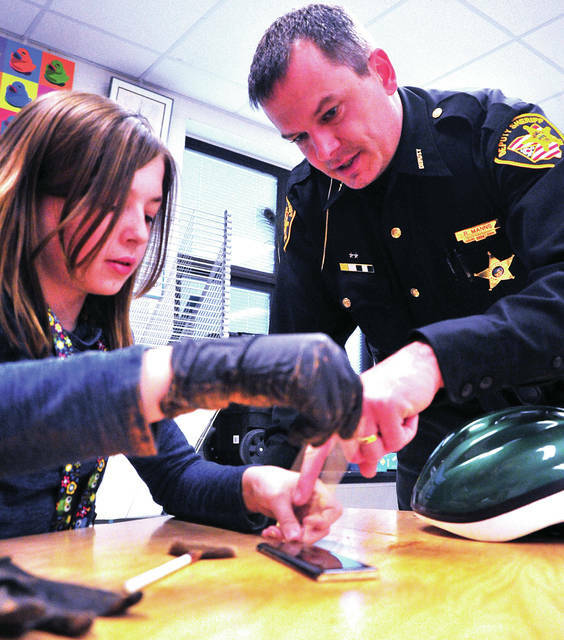 Miami East fifth grader Kaci Manns gets some advice on lifting fingerprints from her father, Miami County Sheriff’s Deputy Richard Manns, during a Crime Scene Investigation class at Miami East Elementary School on Monday. 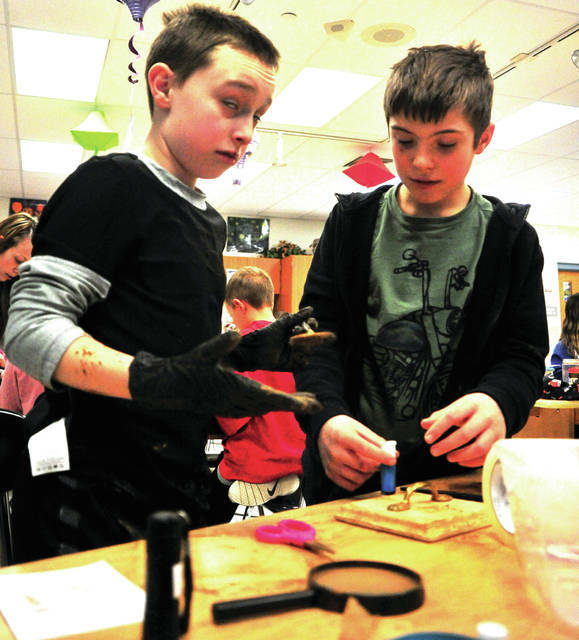 Fifth grade students Cayden Wesco, left, and Dylan Arnold dust for fingerprints during a CSI class at Miami East Elementary School on Monday. CASSTOWN — One Miami County Sheriff’s Office school resource officer is going above the call of duty to show students that — unlike popular crime television shows — crime cases can’t be solved in an hour. Miami County Sheriff’s Office SRO Deputy Roger Davidson started the Miami East CSI Club for fifth and sixth grade students this winter. Davidson said it was a goal of his to start the club for students after being employed as a full-time SRO by the district last fall. Davidson said he wanted to start the program for students after being inspired by the CSI camp the Troy Police Department offers each summer. “I saw Troy had done a CSI camp, so it was on my list to do here at Miami East. There’s been pretty good interest in it,” Davidson said. Students will learn how to package evidence, how to diagram an accident and how officers use technology such as drones in a series of sessions. Davidson said the program will wrap up with a final project to put their all their investigation skills to the test. The club is popular among students who shared how they like to watch crime shows like “CSI” and “Forensic Files” at home. The club has approximately 26 students who meet once a week for an hour-and-a-half after school. “It’s fun because you get to learn how to do stuff like the officers do,” said Abby Maxson, a sixth grader. Maxson carefully dusted the cocoa powder on the porcelain plate. Using tape, she lifted off a fingerprint, holding it up to see the clarity ridges before placing it on paper, marking the print and placing it in a bag and filing it. “It’s not as easy as it sounds, is it?” Davidson said at the end of the class. “I like watching the crime TV shows. The CSI club is pretty cool. We don’t get to do cool stuff like this in class,” said sixth grader Haley Barnes. Sixth grader Dalton Schreadley said he’s looking forward to other sessions in the CSI Club. “I can’t wait until the crash scenes,” he said. Sixth grader Connor Maxson is also looking forward to learning more about the more gruesome side of law enforcement investigations. “The blood spatter part sounds interesting. Trying to figure out where it came from and how it happened, that’s so cool,” he said. The CSI Club shows students how law enforcement uses science, math, technology and logic in their field in a variety of ways from measuring speed for traffic accidents, DNA and fingerprints and other technical aspects of general law enforcement work. Davidson said the CSI Club is supported with help from the Piqua Walmart, where he buys supplies for each session. For Monday’s class on fingerprinting, students used cocoa powder and makeup brushes to mimic the process of lifting fingerprints. Students took fingerprints from a variety items including doorknobs, bike helmets, jars and tile. SRO Davidson said the class also uses old and outdated equipment from the sheriff’s office like cameras for students to learn the basics of photographing, logging and filing evidence. Davidson said the CSI Club will invite deputies to share their expertise in their field, such as traffic crash reconstruction, with the students. “The kids really enjoy it. I have older students who have told me they want to do it, so we may try to expand it in the future,” Davidson said.